The 2018-19 Celebration Foundation Concert Series. Florida Symphony Youth Orchestras continues to educate and inspire Central Florida’s top young musicians. The programs that make up the FSYO all reflect a commitment to provide young musicians with the opportunity to strengthen their musical talents and develop an appreciation of the arts through music, while also developing the strong leadership skills, dedication, discipline, accountability, and self-awareness that will lead them confidently into their future endeavors. The Symphonic Orchestra, under Music Director Hanrich Claassen, is a pre-professional, conservatory level orchestra in which students are challenged with exceptionally difficult literature, and perform at several concerts and engagements throughout the year. Event location : Community Presbyterian Church 511 Celebration Ave.
It’s time to update your Summer Handbag Wardrobe! at Food Truck Friday in Celebration! Emily V, a member of Girl Scout Troop #1436 and a member of the Celebration Foundation WINGS Power Lunches at Celebration K-8 is sponsoring a Handbag Auction as a fundraiser for the WINGS program. 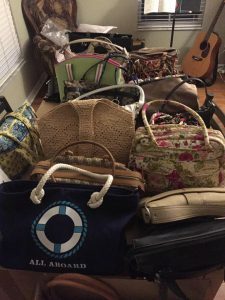 Over 50 name brand and designer handbags have been donated…some new and some gently used. What an excellent opportunity to get a little something new for the summer at Emily’s Handbag Auction! She is working on her Bronze Award and benefiting a program she loves! Thank you Emily V. for demonstrating such great leadership skills and initiative! The next Lunch & Learn, sponsored by the Celebration Foundation, will be held at Town Hall, 851 Celebration Avenue on Wednesday, January 13 from 11:30 a.m. – 1 p.m. Lunch is $5 and payable at the door, but please register by calling the Celebration Foundation, 407-566-1234. We are pleased to bring back Diane Reynolds RN, BSN, MA, CMC (Certified Care Manager) of FHL Care Management, LLC to share her expertise and answer your questions. Diane can help you understand how all the components…financial, legal, medical…work together to create a comprehensive care management program as you get older. Don’t wait till you are in crisis, care management is about being proactive and having a plan. 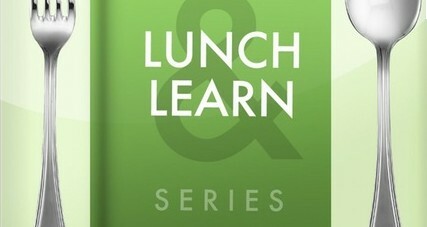 Lunch & Learn is June 10th, then we will be taking a break until September, join us! The next Thriving in Place Lunch & Learn on June 10th will feature Monarcha Marcet from Adventure in Building, Inc. Monarcha will discuss “Ease of Use” in residential planning and renovation. 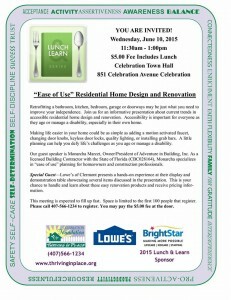 Also at June’s meeting, Lowe’s Home Improvement of Clermont will have a display table of easy home renovation items. Join us at Town Hall 851 Celebration Avenue from 11:30am-1:00pm for lunch (cost is $5 per person at the door). Please RSVP by calling the Celebration Foundation office at 407-566-1234. The Celebration Foundation would like to cordially invite you to their Mardi Gras Party with a Purpose! This coming February 7, 2015 join the Celebration Foundation at the beautiful Reunion Resort Grande Ballroom. Tickets are available now for purchase from Eventbrite. Individual tickets are $100 and corporate tables are available for $1500. Tickets include: 6:00 – 7:30 PM Cocktails, Raffle and Silent Auction followed by 7:30 – 11:00 PM Dinner, Live Auction, Entertainment and Dancing. The Reunion Resort is offering a package deal for the night, $179 gets you tickets to the Mardi Gras event from Celebration Foundation and a 1-3 bedroom suite for the night. This special rate is good from February 5-10, 2015. 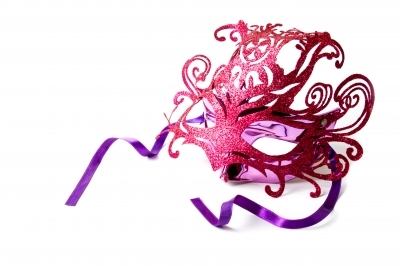 To receive this special rate call the Reunion Wyndham Grande Golf and Spa Resort at 866-880-8563 and ask fro the Mardi Gras room rate. 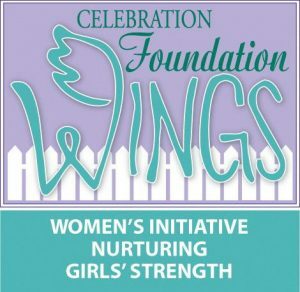 For more information visit the Celebration Foundation on the web. The Celebration community is gathering together to help Celebration High School students that don’t have school supplies for this year. Make a difference by helping out students that qualify to be considered a “Family in Transition” and help them rise above their current situation. Purchase school supplies and bring those donations to the Celebration K-8 School Open House on August 16th from 3 pm – 6 pm. You can also drop off your donations in Downtown Celebration on August 17th from 10 am – 2 pm. 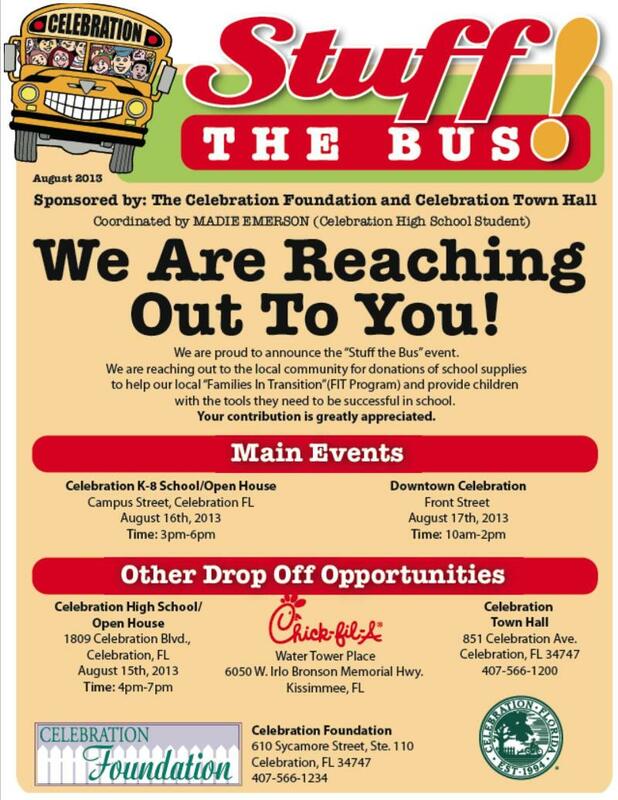 If you cannot attend either event, you may drop your donations off at the Celebration High School Open House on August 15th from 4 pm – 7 pm or during normal business hours at the Water Tower Place Chick-Fil-A, Celebration Town Hall, or the Celebration Foundation. Thank you for helping us offer a brighter future to local students!